The Supreme court has validated the Indian government’s policy of enforcing Aadhar and making it mandatory everywhere. As of 05-01-2019, you don’t need an Aadhaar to open a bank account. However, you need to link Aadhaar number to avail government level subsidies and apply for specific programs. If you’re an HDFC bank client, you now have the facility to add your Aadhar number online using HDFC netbanking website. Those who already have an Aadhaar number may follow these simple steps to map it to HDFC Bank customer ID without having to visit the branch. First, login to HDFC online netbanking website with your User ID and password. 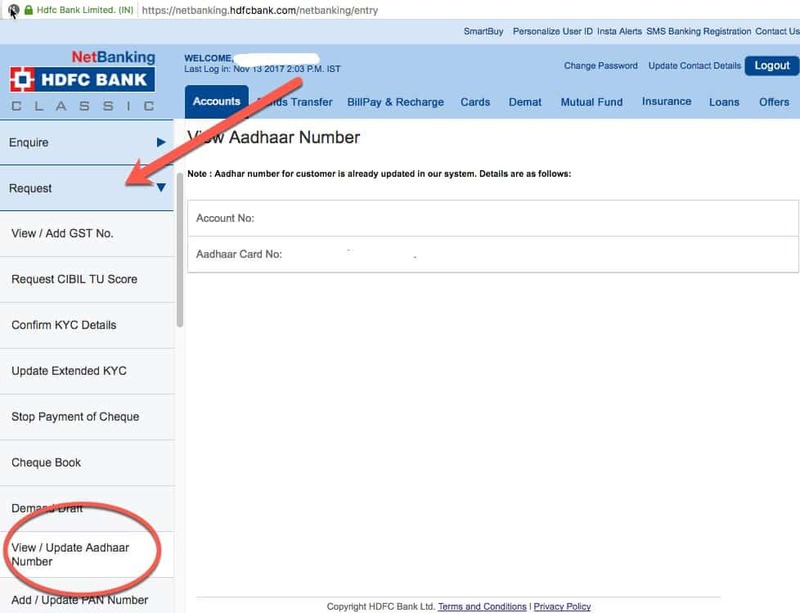 The netbanking portal will pop up a notification if the user doesn’t have aadhar details on his profile. Just click on it proceed. In case you don’t see the link to add aadhar on the netbanking home page, click and expand the Request drop-down menu, under “Accounts” tab. Scroll down and find the option to Update Aadhaar number. Now, choose the HDFC Bank account to which you would like to Add the Aadhaar card. Enter the 12 digit Aadhaar number in the box provide and confirm. That’s it. You will now see the confirmation page. If you need further clarification on these steps, watch our video on how to link Aadhaar number online on HDFC Bank. In addition to the netbanking option, HDFC Bank recently launched an online Aadhaar updation form for all its customers. Click here to open HDFC Aadhaar linkage form. Put your Aadhaar and PAN number, HDFC Bank customer ID, account number and mobile number to the fields provided. Complete the OTP verification through SMS, and then submit the application online. It will take at least 2 working days for HDFC Bank to verify with UIDAI and link aadhaar number to your account. Update: The link is re-directing to HDFC Bank website. It looks like they are no longer accepting Aaadhar link requests through external forms. Try the alternatives written below. No access to HDFC Netbanking and online services? Away from your PC? Not a problem. 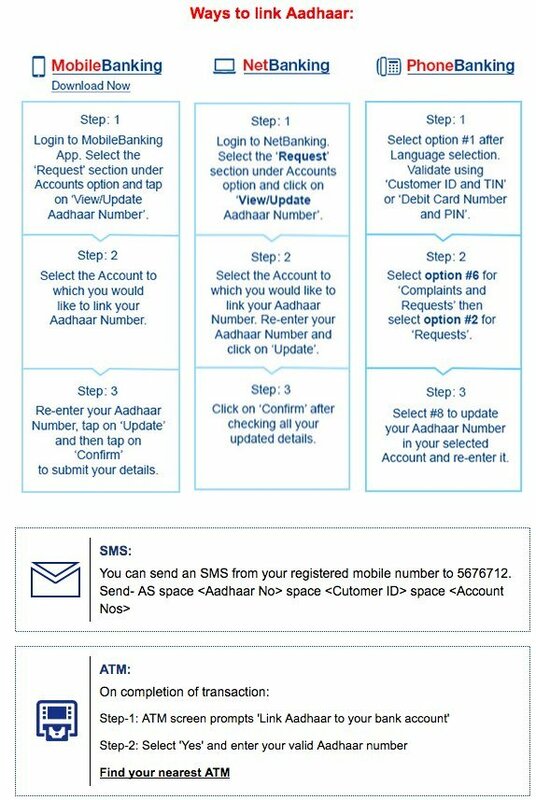 Consider one of the following options for your Aadhaar card registration to HDFC Bank account. Method 1: Use HDFC Mobile Banking app for Android or iOS to update Aadhaar details on the go. Sign in to HDFC mobile app, click on Accounts, and then open Request menu. Now, click on Update/View Aadhaar similar to HDFC netbanking website, put the card details and confirm. Method 2: Obviously the easiest way to link Aadhaar to HDFC Bank is through SMS. Format for HDFC Adhaar linking SMS is AS AadhaarNumber HDFCcustID HDFCaccountNumber. Send this SMS to 5676712 from your phone number activated for HDFC Mobile Banking. Method 3: Dial the HDFC Phone Banking number in your locality. In my area Cochin, Kerala it is 0484-6160616. The IVR facility requires your HDFC Bank debit card number and PIN for validation. After validation, press the number key 6 and then 2 for opening the Aadhaar request message. Enter your Aadhar number as you hear the telephonic prompt, and confirm it. Method 4: You would have already noticed the alert for Aadhar linking if you have been to an HDFC Bank ATM recently. Yes, it is possible to link Aadhaar number to HDFC account through the official ATMs. Insert your debit card, verify PIN, and select ‘YES’ when the machine shows “Update Aadhaar” message. Finally, if you would like to go to the Bank itself, get the official form here. Fill and take it to the HDFC Bank branch for adding or updating the Aadhaar/PAN number. Don’t forget to carry the original copy of your Aadhaar Card for verification. Since RBI’s decision is to continue with Aadhar implementation on all bank networks, it is better that you link your Aadhar number to HDFC bank account avoid any last minute rush. HDFC employees manually verify all Aadhaar link requests before adding changes to your account. And they send an SMS once the Aadhaar update process completes. However, you may manually check HDFC Aadhaar link status through online and mobile banking. Just log in to HDFC netbanking portal and proceed to Accounts>Requests> and then click View Aaadhar Number option on the sidebar. Your linking is successful if the status says ” Aadhaar number for the customer is already updated in our system.” You may view the details of Aadhar and associated account, below that line.